You may have seen the new parking garage here at One Loudoun, but we can bet that you don’t know how many spots there are, or all of the cool technology incorporated into the structure. Check out the infographic below to get to know the One Loudoun Parking Garage a little bit better! Our best-kept secret is finally out! Evolve Salon and Spa is One Loudoun’s premier location for all of your salon and spa needs. Located inside of The Fitness Equation, Evolve Salon and Spa opened its doors in February of this year and set the standard early on for professional and luxury salon and spa services! Recently, we took a trip to Evolve so that we could learn more about everything they have to offer, get to know the team, and experience a transformation for ourselves. Evolve Salon and Spa inside The Fitness Equation. Sonia and Chris are the owners of Evolve – each with their own backgrounds in the field, with a combined 45+ years of experience. Sonia worked in the original salon of the Fitness Equation in Reston and free-lanced as a hair stylist for 18 years. Chris attended Graham Webb in Arlington, worked as a hair stylist for several years, and later purchased a home in Ashburn, hoping to one day open a salon at One Loudoun. As they tell it, fate brought the two business partners together at Evolve. The name came from Sonia’s favorite idea of an “evolution” from “a little seed into a beautiful flower”. Chris suggested they shorten in to “evolve” and the rest was history! The Color Bar at Evolve: All hair color and mixing on display for guests to see while they enjoy a coffee, hot tea, or variety of fruit enhanced water. The first thing to know is that guests at Evolve do not have to be a member of The Fitness Equation! Evolve offers a long list of services including hair, skin care, makeup, nail and massage services. In addition to offering a multitude of services, Evolve is an exclusive area retailer of Kérastase professional hair care products, and also offer products from IS Clinical, Aquage, Gehwol, and Wella. The manicure, pedicure, and shampoo stations at Evolve. While we were there, we opted for hair “transformations”, as Sonia called them, (which were certainly unforgettable) including a shampoo, cut, and style. First was the shampoo treatment, which was incredibly relaxing and unlike anything we had experienced before. The Evolve signature shampoo service included a scalp massage, hot towel treatment, and wash, all while you are lying on a shampoo bed. As two women who do not get their hair professionally cut often, both of us desperately needed some TLC for our locks. We both had the pleasure of having master stylist and owner, Sonia, cut and style our hair. Owners Chris and Sonia working their magic at the salon. Sonia knew exactly what to do based on our hair types and explained what she was doing every step of the way, with lots of laughs exchanged in between. Sonia was also willing to listen to each of our concerns and asked us about our hair care routines. Her years of experience and her fun and infectious energy makes you excited to be sitting in her chair. She provided tricks and tips for us throughout the styling session and chatted with us about everything from her favorite products to what we were doing over the weekend. Check out our before and after photos below! Visit the Evolve team at The Fitness Equation open houses (held every month), or at one of their own events. Evolve recently hosted a Breast Cancer Awareness event at their salon featuring giveaways, refreshments, and pink hair extensions, with proceeds going to the Susan G. Koman Foundation. The salon plans to host events every few months, so keep an eye out on their Facebook page! The low down: The stylists and the entire atmosphere at Evolve puts you at ease right away. From the relaxing shampoo and head massage to the actual cut and style, you automatically trust what they are doing. We will absolutely be back to experience their other services. Perhaps one of the most endearing qualities about Evolve is that the staff truly is like a family and they welcome each guest in with open arms. Every single guest that walked through the door at Evolve received a warm greeting; whether it was a familiar face receiving hugs from Sonia, or a new customer getting their first salon and spa tour. You can find the Evolve team at One Loudoun’s 4th Annual Tree Lighting giving away $10 and $20 gift cards, as well as other goodies, and talking about all of the services at Evolve. With the holidays coming up, what better gift to give than the gift of relaxation for a spa day, couples massage, or total hair transformation! To make your appointment today, visit spaevolve.com, or call 703-723-8200 and be sure to follow Evolve on Facebook, Twitter, and Instagram for promotions and deals! The greatness of a community cannot truly be measured by anything but how much residents love living there! With that being said, what we can do is pinpoint a few things that are common signs of a great community, with the help of a list curated by Trulia.com. As they state in this article, “You’re not just buying or renting a home – you are also becoming part of a neighborhood.” Take a look below to discover how everything on their list can be found here at One Loudoun! Great Schools: The Loudoun County School District has been recognized as one of the top in Virginia, the 3rd best according to Niche.com. Living in One Loudoun guarantees that your children are given exceptional opportunities to learn and thrive in the classroom. Neighborhood Association: A neighborhood association makes life for residents so much easier by organizing conveniences that would otherwise become a headache. To learn more about the One Loudoun Neighborhood Association, visit https://www.1lna.com. Safety and security: As a close-knit neighborhood and community, we strive to provide safety and security on a regular basis for you and your family. Additionally, the Loudoun County Sheriff’s Office is currently being built right here at One Loudoun. Outdoor amenities: There are many outdoor amenities available to residents of One Loudoun, just within walking distance of your home! Some of the favorite amenities include Central Park, The Plaza, nature trails, and the pool, playground, tennis courts, volleyball court and more at The Club at One Loudoun. History: The history of Ashburn, VA is reflected by the unique landscape and historic wonders surrounding One Loudoun. Our community amphitheater, The Barn at One Loudoun, is also a historic building, dating back to the 1800’s when it belonged to Mr. Charles Harris. Harris was one of the first African-Americans to own land in the area and often hosted gatherings on his properties, which is now reflected in the gatherings hosted at The Barn. Access to care: Our community is centrally located near all types of businesses offering health and wellness care. One Loudoun is home to My Eye Dr., Kravitz Orthodontics, Ashburn Oral Surgery, Advanced Corrective Chiropractic, Loudoun Smile Center, and Pediatric Dentistry of One Loudoun. We are also located less than 3 miles from the nearest hospital. Family friendly: With areas specially designed for families in mind, what better place to raise your family? Across the One Loudoun community, there are multiple playgrounds, parks, and even The Plaza has a fountain perfect for the kids to play in during the warm months. We even have our own elementary school! Public transportation: Since One Loudoun is in close proximity to Dulles International Airport and other conveniences of Northern VA, public transportation is key. To learn more about the transportation systems in Loudoun County, click here. Restaurants and shopping: One Loudoun is Loudoun County’s premier destination for dining and shopping! The community is continuously welcoming more shopping and dining options to our repertoire, with more coming soon, like Eddie Merlot’s, Fortessa Tableware Solutions, and Boho Nation! Nightlife and entertainment: There is never a shortage of fun things to do here at One Loudoun! From year-round community and neighborhood events, to the Alamo Drafthouse and other trendy bar/restaurants like Bar Louie, your day from sun up to sun down is sure to be anything but boring! Walkability: See for yourself on our interactive site plan: you can walk everywhere in the One Loudoun community! This one of the aspects that residents love the most; you can walk from home to the store or out to dinner and not worry about driving around! A perfect match: One Loudoun is suited to fit all types of lifestyles. Whether you are part of a young family, or looking to retire soon, there is something for everyone here in Loudoun’s New Downtown! In case you were wondering, YES, you can purchase a brand new home right here in One Loudoun! Visit our website here to discover One Loudoun in Ashburn, VA! One Loudoun Featured in BUILDER Online’s Recap of 2016 GALA Awards! One Loudoun was recently featured by BUILDER Online in their article, “Local Builder Wins Big in GALA Awards”, recapping an amazing night at the 2016 Great American Living Awards! Read the original article from BuilderOnline.com below and learn more about the awards our amazing community received! Virginia-based Miller & Smith took several honors at the recent Great American Living Awards. Along with large production builders such as Pulte, NVR, and Hovnanian, local firm Miller & Smith took several top honors in design and architecture at the Great American Living Awards (GALA) ceremony earlier this month. Winners of the prestigious competition for metropolitan Washington home builders, developers, architects, sales, marketing, merchandising, and advertising professionals are known as the area’s “Best of the Best.” McLean, Va.-based Miller & Smith won awards in four design categories. Click the slide show at right to view the winning projects. In addition, the company’s development affiliate, One Loudoun LLC, was also honored in the marketing categories of best website for master planned community, best online ad campaign, and best integrated marketing campaign for a master planned/mixed-use community. The Great American Living Awards (GALA) celebrate excellence in new home architecture, interior design and sales and marketing. The ceremony is presented annually by the Washington Metropolitan Sales & Marketing Council (WMSMC), the Northern Virginia Building Industry Association (NVBIA) and the Maryland National Capital Building Industry Association (MNCBIA). Founded in 1964, Miller & Smith is active in both residential and commercial real estate. In 2015, Miller & Smith sold 86 single-family homes, 159 townhomes, and 33 condos. Even though the summer has come and gone, there are still several fall activities to experience here at One Loudoun! Whether you are looking for a great outdoor activity for the whole family, just the kids, or the older crowd, here are 8 ways to make the most out of the fall season here at One Loudoun! Watch football on The Plaza – With football season in full swing and the gorgeous weather here in Ashburn, VA, it’s the perfect time to join friends and family on The Plaza at One Loudoun to watch the big game on the big screens! Create a fall scavenger hunt – If you’re looking for an easy afternoon activity to enjoy with your family, create a fall scavenger hunt throughout Central Park at One Loudoun! See who can find the prettiest or most unique leaves and bring them home for fall themed crafts. Prepare for the holiday season – It’s never too early to take advantage of the conveniences that are right here in One Loudoun to help you prepare for the holidays! Order your Thanksgiving turkey at the One Loudoun farmer’s market, or get a head start on your holiday shopping at Scout & Molly’s Boutique! Go apple picking or visit a winery – Because of One Loudoun’s unique location, we are in close proximity to a long list of area amenities including local Loudoun County wineries and farms. Winery tours on a crisp fall day make for the perfect adult outing, and apple picking is a great activity for the kids! Take advantage of the Dog Park – Now that the temperatures have cooled off from the heat of the summertime, it is the perfect time to bring your pups over to the One Loudoun Dog Park! Grab some comfort food – The chilly fall air can only by soothed by a warm atmosphere and comfort food! At One Loudoun, you have so many amazing choices for some of the best dining options around. From our brand new Copperwood Tavern and Aggio restaurants, to all time favorites like Matchbox and Uncle Julio’s, there is something for everyone to enjoy! Admire the foliage in Central Park – Whether or not fall is your favorite season, you can’t deny the beautiful fall foliage that we see here in Ashburn, VA. A perfect way to enjoy the foliage is to have a picnic in Central Park or sit on a bench swing with a good book! Want even more of everything to do here at One Loudoun? Visit our website and sign up for updates so you can stay in the know about the latest events and happenings! Just today, Time Magazine released their annual list of “Best Places to Live” for 2016, where Ashburn, VA made the Top 50 and included a special mention of our very own One Loudoun! According to the article, Time’s rankings are based on 60 factors including taxes, school districts, job opportunities, etc., with economic factors taking priority in the ranking system. Ashburn, VA ranked #22 on the Top 50 list for this year, and with good reason! According to Time, the abundant job opportunities at major corporations, in addition to the close proximity of Dulles International, boost Ashburn high on the list. Time stated, “At the town’s epicenter is One Loudoun, a community that blends offices, shops, restaurants, entertainment, condominiums, and hotels where people gather for outdoor concerts, farmer’s markets, 5K races, and the December tree lighting ceremony.” In this article, they also mention the new home market that continues to grow here at One Loudoun. To read more about why Ashburn is one of the best places to live, visit http://time.com/money for the full article and list for 2016! One Loudoun is rapidly growing as Loudoun County’s premier mixed-use community and we are now offering even more new home options for you and your family. If you are looking to purchase a new home at One Loudoun, not only will current residents tell you how great it is, but also how living here will change your life! Check out the list below for the 6 ways living in a mixed-use community will change your life. 1. A healthier lifestyle: As a mixed-use community, One Loudoun offers plenty of opportunities to get outside and be active. Features like community walkability, our very own Central Park, and even The Fitness Equation fitness center promote a healthy lifestyle in a convenient way. 2. Space to relax: There are many possibilities when you are looking to find your favorite place for some R&R at One Loudoun, even if it’s in your own home. Pick a favorite corner at the bar at World of Beer, discover that nice shady bench in the park, or make visiting the pool a weekly routine to get some sun. However you choose to unwind, the options are endless! 3. Community becomes family: At One Loudoun, you are a part of the One Loudoun family! On any given day you will find neighborhood children playing in the fountain on The Plaza together or neighbors enjoying a meal at one of our amazing restaurants. With a full calendar of events at One Loudoun, including exclusive events for residents and events open to the public, there is never a shortage of places to meet your neighbors and make lifelong friends. 4. More job opportunities: With the current and future expansion of our retail and office spaces, there are constantly new opportunities for our residents to work in their own community! One Loudoun is a mixed-use community meant to have residents live, work, dine, and play in one convenient location. 5. Accessibility is unparalleled: Access to all of the goods and services you need on a regular basis is just steps away from your home. Imagine walking out the front door and heading straight over to Fresh Market for groceries or Flow Blow Dry and Beauty Bar for a hair styling session – all of that and more is possible here at One Loudoun! Additionally, One Loudoun is close to major roads and Dulles International airport for easy travel access anywhere. 6. A sense of security: Everyone knows that safety and security are both main priorities in close-knit neighborhoods such as One Loudoun. The Neighborhood Association at One Loudoun ensures that you have access to all of the necessary resources to live safely, including the Loudoun County Sheriff Station, which will soon be located right here at One Loudoun. Needless to say all of these factors put together will bring a better quality of life for your and your family! 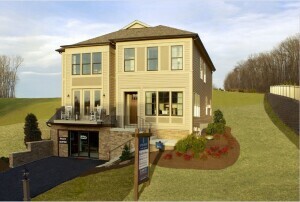 For more information on how you can own a brand new home at One Loudoun, visit https://oneloudoun.com/living-at-one-loudoun/. If you’re a family who likes to entertain and have a great time in your own home, then Great Gatherings is the place for you! With all of the entertaining items you will need all in one place, you can put together the perfect outdoor space, rec room, bar area, or kitchen! Walking into Great Gatherings is overwhelming, but in the best way possible, because there are so many different options to complete the perfect space in your home! The front of the store is lined with shelves and tables containing tableware, barware, and other dining accessories. Each display is arranged beautifully and meticulously coordinated by style, color, and design. How cute is this summery plate display in the photo below? Because Great Gatherings is a local business, with just 5 locations spread throughout Maryland and Virginia, you can tell the product selection is catered to the local scene. When checking out the tableware, we even found collegiate plates, cups, hand towels, and other accessories representing some of the local universities. As for your bar area, Great Gatherings has all of the barware you would see at a professional bar space! From cocktail books, to mixing supplies, and glassware for every type of drink, they really have it all. As you make your way further into the warehouse-sized store, you will begin to see a large assortment of outdoor furniture, from table and chair sets, to luxurious fire pits, couches, and more! Among one of the many sections in this amazing store is the game section. Here, we came across the coolest version of “Clue” known to mankind, with 3D rooms built into a polished wooden box. There are other awesome game selections, like darts and plenty of options for a pool table! In the very back of the store you’ll find a great selection of bars. With a variety of styles, colors, and sizes to choose from, you will absolutely find your perfect in-home bar at Great Gatherings! They set up each bar inside the store so you can get an idea of what it will look like in your home – right next to the new matching pool table! Possibly the best thing about Great Gatherings is that no matter how many times you visit, you could walk through 5 more times and discover things you did not see before. This is why the amazing and knowledgeable staff is there to greet you right when you enter through the doors. They are happy to show you where everything is located and answer and of your questions. Next time you’re here at One Loudoun, stop by Great Gatherings to browse, add to your Christmas list, or even purchase a brand new piece for your home! We promise you will be amazed by the selection and quality that GG has to offer! “Burgers, Beer, Bourbon” is the tagline of b One Loudoun, one of the community’s amazing restaurants that opened its doors just this past January. What began as the simple idea of eating a quality burger while enjoying your favorite beer or bourbon and good company, eventually turned into b Restaurants. After visiting farms high and low to find out the secret to a perfect burger, the first location opened in Connecticut in 2006, coincidentally in the same state where the hamburger originated. Walking into b One Loudoun, you immediately get the feel of a restaurant inspired by bourbon itself. The comfortable atmosphere is a mix of modern and rustic, with warm woods, exposed brick, and red and auburn colored décor in addition to some amazing light fixtures. At b One Loudoun, a first glance of the menu caused a slight panic of “how can I choose?” With the help of recommendations from a few friends and our server’s knowledge of the popular dishes, we were able to finally make some decisions while chowing down on some pickles (made in house). For a starter, we ordered the pretzels and house-made sausages served with honey mustard and jalapeno cheese sauce. It took only one bite of the sausage to recognize how fresh and well seasoned it was! The pretzels were perfectly baked as well and the jalapeno cheese dip was a great complement. Next it was time to order our main dishes (which we had the hardest time doing). When we say this establishment has nailed the meaning of a quality burger, we mean they use beef that is ground in house 2-3 times daily, hand formed, American and source verified, and always fresh (never frozen). Additionally, other ingredients are sourced from local farms and markets, while the pork and chicken are also fresh and ground in-house. If you’re not into burgers, we forgive you, but there are also a plethora of non-beef burger options to choose from and the menu is very friendly to those who are gluten-free. Many appetizers are gluten-free and options include a GF burger bun or having your burger served “in the grass” (atop iceberg lettuce). Since we wanted to try a few different things, we decided on the Pretzel burger with fancy fries and the Burger Salad. The pretzel burger was cooked to perfection and oh so fresh! The pretzel bun was a fantastic addition and an option to add to any burger, although we have heard their regular buns are amazingly buttery and delicious too. The thing we loved most about this burger (and all of them on the menu) is that it was not overly decorated with toppings, which is ideal for tasting all of those delicious flavors from the fresh beef. The burger salad is best described as a deconstructed burger: iceberg and romaine lettuce, tomatoes, bacon, cheddar, red onion, a ring of pickles, and oh yes, French fries (you can also get tater tots). This salad is tossed in their “special sauce” and topped with a cheeseburger and frizzled onions. The salad was so good, we have seriously considered eating our burgers in salad form from now on! After our delicious meal, we headed over to check out the bar, which is fully stocked with pretty much any kind of bourbon you could ever want. There are so many on hand, they need the entire wall to house them all and a ladder to reach the top shelf. The horseshoe shaped bar allows for plenty of seating and there are also high-top tables for overflow. As seen below, there are 14 beer taps, and over 60 bottled and canned beers, with many local favorites available! Ask anyone who has been to b One Loudoun, and they will tell you that the bourbon and beer lists offer an excellent selection and the burgers are fresh and tasty. So there you have it: burgers, beer, and bourbon served harmoniously together only at b One Loudoun! For more information on all of the restaurants at One Loudoun, visit our website at https://oneloudoun.com/.